Let me start this review by saying that you cannot really review a lock without breaking it, but also that anybody with angle grinder can break any lock in minutes: no exceptions. The focus of review is on installation and usage. It uses external sources regarding the security. Update June 2015: in an attempted theft both locks have been broken, for the result see the bottom of the page. What is a ring lock? The Axa Defender is a ring lock that stays permanently on the bicycle. It is very common in The Netherlands and many other European countries. Many manufacturers include one on their city bikes and there are even versions that are integrated in the bicycle frame. They are less known in America where most bicycles are racing or mountain bikes, I hope that by writing this review I might reach some people who have never considered a ring lock before. Ring locks are also sometimes called o-lock, wheel lock or frame lock depending on who you'll ask. What I like about the ring lock is that you simply cannot forget to bring it. With other locks you can temped to leave it at home because you think you will not need it, and then end up in a situation where you do need it. Another good thing is that they lock the rear wheel and frame together. The key stays in the lock when your bike is unlocked so you cannot forget to bring it either. For people who carry children in the back there are are other ring locks that allow you to remove the key to prevent the child from closing the lock while riding. However, with just a ring lock anybody can just lift up your bicycle and walk away with it (or put it in a truck), but in those cases lock is the plug-in chain. After locking the bike you can wrap a chain around any solid object and plug it in. This gives you two locks with just one key. However, the best part is that the chain is does not need to loop around. This means that the chain is effectively twice as long as a similar normal chain without the extra weight. For my bicycle I got the Axa Defender, which is one of the toughest ring locks available today. There are several versions around. 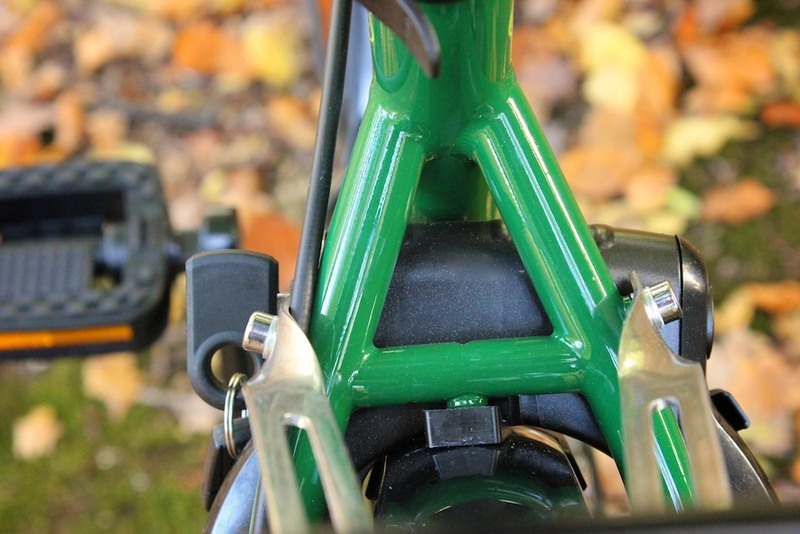 Many European city bicycles come equipped with a ring lock which is attached to a Pletscher plate that has been added to the frame just exactly for that purpose. More "sporty" bicycles hardly never have a Pletscher plate. The Axa Defender can be mounted on the seat stays with a special mounting kit. It usually included, but also sold separately. I installed the lock on two bicycles, both with mudguards already installed. The first one had a 20.5" frame and 50 mm tires. The opening of the lock is only 50mm wide on the bottom, but wider in the middle. As my tires are a bit narrower because of the narrow rims that they are on fitting the lock was no problem, and there is enough clearance. For wider tires there is also the Axa Solid Plus that has an opening of 58 mm. The lock comes with two keys. Some versions come with one key that can fold in, but mine came with two regular keys, which I prefer anyway. The keys have the the teeth on the inside that means you cannot get not easily get a copy made, but Axa offers a key service that I will discuss later. The reason that the teeth are on the inside is to make the cylinder of the lock harder to pick for lock pickers. Personally I like having the teeth on the inside as it makes the keys less likely to get damaged and less likely to scratch something with it. Installation requires a flathead screwdriver, and I also found a pair of tweezers helpful. It was not exactly difficult, but I would describe the process as finicky. It is possible to get the lock on pretty tight, but it is not as sturdy as bolting it on. 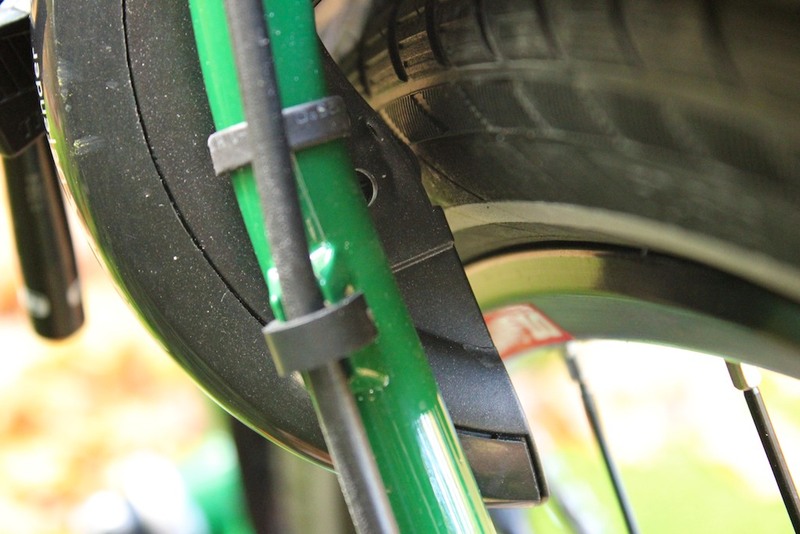 The lock would barely fit around the 50 mm tires, but once they were inflated to a higher pressure (within specifications) they would rub a little against the plastic of the lock mounts. I solved this by filing the plastic off a little. I couldn't get one of the strips tight around the seat stay which would make the lock wiggle a bit and rub the paint. I solved this by butting a small piece of rubber (from an old inner tube) between. But this did not remain in place for long after use. The other bicycle I installed the lock on had a 19" frame and 40 mm wide tires. I would have expected that this would be easier, but the size of the frame was the problem here. The cylinder of the Axa Defender is 46 mm high, which is not that high, but in this case it was not small enough. One way around this problem is to mount the lock on top of the seat stays, but in this case that would interfere with the rear rack. I solved this by moving the mudguard a little bit down by adding some spacers. 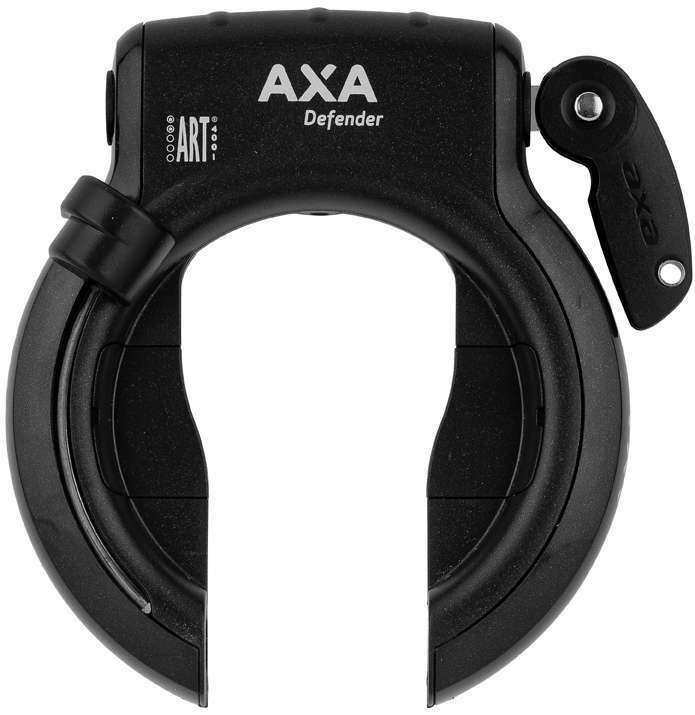 Axa Defender ring lock, black version with folding key. On a 20.5" frame there is more than enough space for the lock. On a slightly smaller 19" frame the lock barely fits. The opening is just wide enough for 50 mm tires. 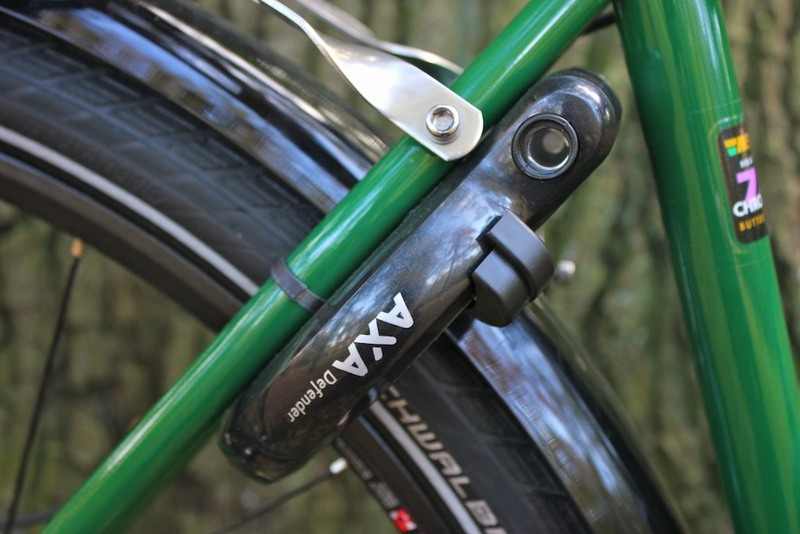 Some extra spacers push the mudguard down to make the lock fit on the smaller frame. Most lock manufacturers have their own rating system which makes it hard to compare locks across brands. Many countries have some independent organization for the certification of (bicycle) locks. In The Netherlands this is the Foundation ART. The Axa Defender has been rated with two stars. If you want to insure your bicycle against theft the insurance company may require that you have lock with a certain rating and when you make a claim can provide two keys to prove that the bicycle was indeed locked. Another aspect of locks that I find essential is whether they offer a key service. Every lock comes with a spare key, however should you lose the key you can always order a new one using the key service. Personally I would recommend ordering a new spare key as soon as you lose one, so that you always have two. Axa offers an international key service, where you can simply order a new key either online or by mail. For 12 euro you can buy a key service paper card at a bike shop (or online) where you write your key number and address on and then simply wait for your key to arrive in the mail. The big disadvantage of a ring lock is that your bicycle is not locked to another object, and although it cannot be ridden and can still easily be taken. This problem can easily be remedied with the optional plug-in chain. The Axa defender has a 10 mm hole where a chain can be inserted. They come in various lengths and colors. Sometimes they are sold with the lock as a set. Please not that other ring locks, even from the same brand may have a different sized hole and you need a plug that fits your lock. Aside from chains there are also cables available, these are lighter but are generally considered less secure as they are relatively easy to cut, even with small tools. I got the one meter chain with a nylon sleeve with the lock. What I really like about this is that you can use almost the full length of the cable. Any other cable lock needs to loop back and therefor has only half the range. This means that the Axa chain is much more versatile as you can wrap it around larger objects like trees or objects that are a bit harder to reach. I have used the lock almost daily for two years. During this time the lock worked well, as you would expect from a lock. It's really handy to be able to quickly lock of the bicycle, since the lock is already in the right place. Just pull down the lever, and pull out the key. It is also useful in situations where you don't want the loaded bicycle to roll on it's own, you can even leave the key in there. The major annoyance is that the mounting system still allows the lock to move around a bit, and wears away the paint on the frame from the continuous rubbing. A minor annoyance is that anything hanging on the key can touch my heel while cycling, as the key cannot be removed from the lock when unlocked. 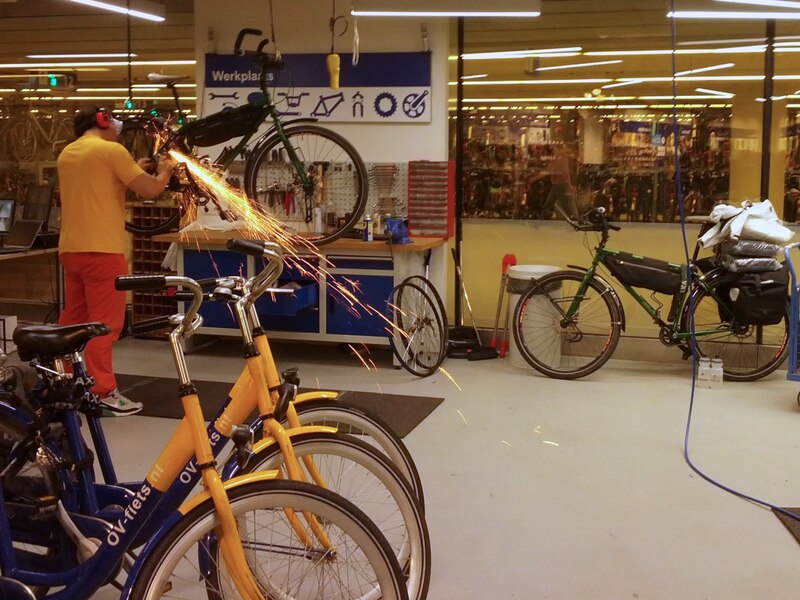 In June 2015 we had parked both our bicycles at the bicycle parking place at Ikea in Delft. My plug-in chain bicycle was locked to a metal pole, the other chain was wrapped around my bicycle. The front wheels were locked together using a single Trelock FS 300 Trigo folding lock. After returning form the store I noticed that the plug-in chain was laying on the floor. The other chain was wrapped around my frame and inserted in my lock. With some effort I was able to open my lock with my key, but could not remove the plug-in chain, or close the lock again. My girlfriend's bicycle would not open. With a lot of effort we were able to insert the key, but the lock would not open. The security people confirmed that bicycles had been stolen from there recently, and they had camera footage of a blond young men stealing bicycles. 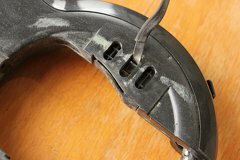 He apparently targeted high-end bicycles with the popular Axa Defender locks by inserting something in the cylinder, and breaking it in the process. When successful he would ride off on the bicycle. In this case he destroyed both locks, but was unable to ride off because the bicycles were still locked together with the front wheels. If the thief had a van he could however simply have lifted up the bicycles, and taken them, since he was able to bypass the plug-in chains. With my girlfriend's rear wheel locked, the security people tried to cut open the lock with a bolt cutter, this was unsuccessful. We had to drag the bicycles across town to the only bike shop that was still open late on Sunday afternoon and had the lock cut there with an angle grinder. The hardened steel of the Axa Defender was able to resist a bolt cutter. The angle grinder was no match for the stuck lock. The lock on my bicycle still had the plug-in chain stuck in there and wrapped around the frame. After removing the lock, smashing it with a hammer while wiggling the key and yanking the chain. The lock eventually was able to open and close again, but not as smooth as before, and the spring that turns the key seemed worn out. Removing the locks revealed damage to the powder coating on the frame, all around where the straps were. Also the front side where the lock was touching, and the top of the mudguard where the lock was rubbing against. The front of the lock after it was cut open and removed with the mounts. Scratch marks on the back of the lock where the frame was touching. 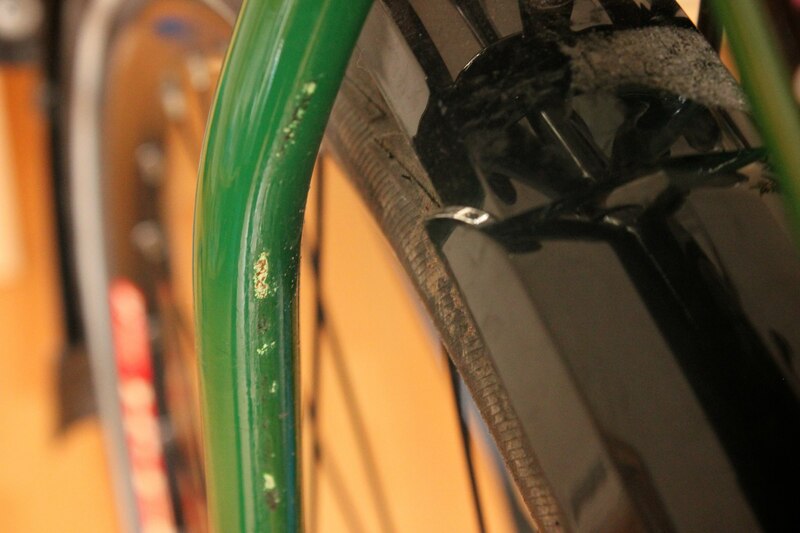 Damage on the frame and mudguard of my girlfriend's bicycle with normal use after two years. The lock served me fine for two years, but the attempted theft did not leave me with a good impression. Although the bicycles were not stolen, I don't think it was thanks to the Axa Defender, but just a matter of luck. The fact that the plug-in chain removed relatively easy, without any power tools disturbs me, especially since the lock is ART certified and is supposed to have an extra secure cylinder. 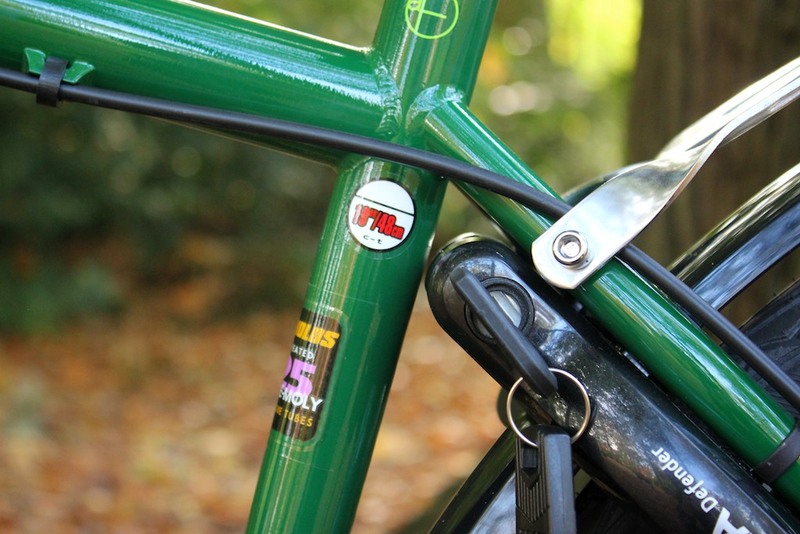 The finicky mounting system allows the lock to the wiggle, rubbing and damaging the mudguard and the frame. If you are going to use this lock, add some scratch protection layer, or use a different mounting system altogether. 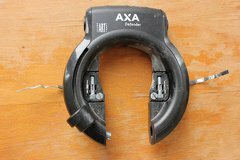 Axa now sells the Victory ring lock, which is more advanced than the Defender, but requires frames with mounting points. As replacement I am going to lock into some alternatives from other manufacturers and report my findings on this website.